An examination of published incidents of loss due to climatic factors involving container cargoes reveals that such incidents affect the entire range of products with no particular class of product being disproportionately represented. On the basis of the published examples, losses caused by sweating are clearly the most striking. Sweating includes both that which occurs on the cargo itself (cargo sweat) and that which drips down onto the cargo from the upper surfaces of the container (container sweat). All classes of goods are affected by this type of loss. For example, reported losses range from nonhygroscopic goods, such as steel and steel products, canned foods, to hygroscopic goods, such as cocoa, coffee, millet, dried fruit, sago, pepper, milk powder, furs, textiles and rattan furniture. In addition to the preponderance of losses due to sweat, a second problem is particularly noticeable, namely the care which is required to adapt the goods, loaded under the climatic conditions of the place of departure, to the climatic conditions of the destination while in transit, without causing damage to the goods or making such damage inevitable due to inadequate adaptation. The theoretical basis on which these issues are addressed resides in "interfacial" physics, which take account of the differences in heat and water vapour transfer at interfaces. The most important basic requirement in this connection is to prevent condensation of the water vapour present in the air at an interface, whether on the container wall boundaries, on the surface of the cargo, in air layers in the vicinity of interfaces or within cargo blocks, if the temperature of the interface falls below the dew point temperature of the surrounding body of air. This requirement in turn makes it necessary to adapt the temperature of the cargo to the anticipated air temperature at the destination. Abrupt changes in temperature or humidity or both occur at these interfaces. If the correct decision as to the suitability of a container for transporting a product without causing damage is to be made, it is essential to have sufficient information about the anticipated climatic conditions in the container. Fig. 9 shows factors which have an influence on the cryptoclimate in the container. 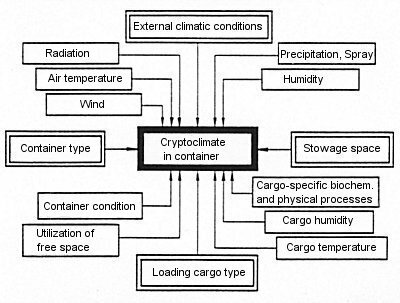 Clarifying the complex thermodynamic processes occurring in containers, especially in containers exposed to radiation, was the objective of the hold meteorology study group at the Warnemünde-Wustrow University of Seafaring (Fig. 10), where cryptoclimate was investigated in two containers, both on a test rig and on board commercial vessels. 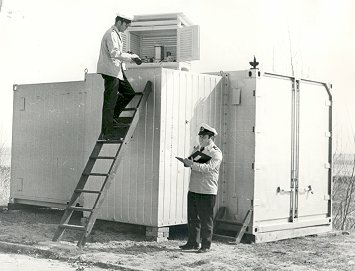 The investigations were carried out on two standard containers, each of which was equipped with an air lock to prevent disturbing the cryptoclimate when monitoring and making measurements and a weather station. The containers were packed with hygroscopic goods, in particular sawdust in one case and packets of sugar wrapped in paper in the other. Climatic conditions during the voyage are determined by the route, season and current weather events. Consequently, it is not entirely straightforwardly possible to transfer the experience gained from one voyage or one route to another as the stresses vary between the different routes and individual voyages. Solar radiation, air temperature and wind are of significance to thermal stress. The temperatures encountered in containers are primarily determined by heat exchange across the steel boundary surfaces, with inward and outward radiant transfers predominating. Good heat-transfer properties, especially through the metal walls, and the relatively large ratio of container surface area to container volume have a favourable impact in this respect (20′ container, approx. 1.80 m²/m³). The average air temperature in the container and also the temperature of the cargo surface are, on a daily average, higher than that of the external air. The daily variation in the individual temperatures is of great significance to maintaining quality. In addition to radiant conditions, external air temperatures, wind and precipitation also have an impact upon temperatures. The great daily variation in overall radiation results in a marked variation in temperature within the container. This variation primarily affects the temperatures of the container air and in particular of the bodies of air in those areas exposed to radiation (e.g. under the container ceiling). Overheating of the air inside the container, i.e. heating to above the external air temperature, may be considerable even under normal conditions. For example, daily overheating on sunny summer days amounts on average to 20°C even in temperate latitudes and is still higher in the subtropics. This means that temperatures of > 50°C, to which the surfaces of the cargo are exposed, may occur in the upper part of the container. Little or no effect of solar radiation. Average maximum overheating is 2.0°C (less than three hours of sunshine per day with low solar altitude, no radiant input on several days of the 10 day measurement period). Weak effect of solar radiation. Average maximum overheating is 5.2°C (four to eight hours of sunshine per day, but without sunshine on each individual day of the measurement decade). Moderate effect of solar radiation. Average maximum overheating is 11.5°C (up to twelve hours of sunshine per day, but without sunshine on each individual day of the measurement decade). Strong effect of solar radiation. Average maximum overheating is 17.3°C (more than twelve hours of sunshine per day, in general on all days). 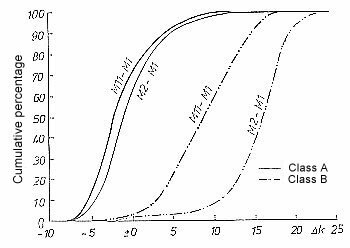 Class A primarily occurs in Central Europe during the autumn and winter months, class B in the autumn and spring, class C in the summer and class D in periods of radiation weather in high summer which are similar to subtropical conditions. as a proportion of all measurements, with overheating in class D being in the 15 – 25°C range in 83.6% of all cases. At an external air temperature of 25 – 30°C, air temperatures within the container may accordingly rise as high as 50 – 55°C. The influence of temperature variations of the container walls and of the air in the container on the temperature of the goods is a significant factor in storage. Fig. 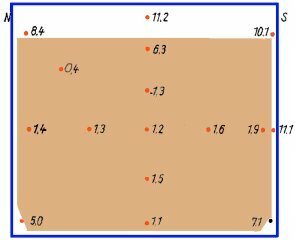 12 shows the daily amplitude in goods temperatures measured within the stack of a container packed with sugar on a sunny day in June: the daily amplitude in the interior of the stack is only 1.2°C, while that for the superficial layer is 6.3°C (see Fig. 12). This means that the temperature in the interior of a stack of cargo adapts to changing external temperatures only very slowly. 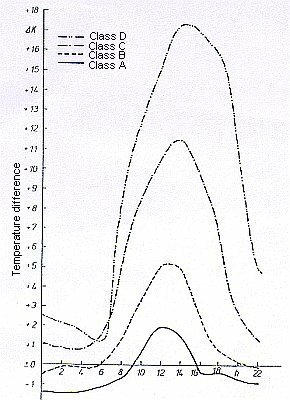 It is clear from these measurements how far the interior temperature of the goods lags behind changes in external air temperature caused by changes in weather conditions (see Fig. 13). The exposure of the goods to thermal stresses is determined by the size of the stack and its internal compactness. Stacks which are so dense that the ambient air cannot freely circulate within the stack do not readily adjust to external temperatures and water vapour also cannot be dissipated. Considerable delays may be observed even with this comparatively small stack in the container. The daily variation in temperature of a packed cargo is less marked. Although none of the cargo is more than 1 m away from a boundary surface of the cargo stack, the daily variations in air temperature in the container have, as can be seen, only a very gradual impact on the daily variation in goods temperature in the interior of the stack. A different temperature regime is to be anticipated in a container which is completely filled with goods than in an empty or partially filled container. Fig. 15 shows, for example, the frequency distribution of overheating in two differently loaded containers. While M 11 was obtained in a container packed with 16 metric tons of sugar (see Figs. 12 and 13), M 2 was simultaneously obtained in a container packed with 1.75 metric tons of bagged sawdust (see Fig. 15) which occupied approx. 30% of the container volume. The differences in humidity were still more extreme. While the sugar container did indeed also constantly exhibit comparatively high relative humidities of 70 – 80%, no appreciable sweating occurred and, after 6 months’ storage, the sugar was unpacked again in perfect condition, whereas severe sweating was constantly observed in the sawdust container. Water vapour conditions in the container are primarily determined by internal factors, i.e. the water vapour conditions are largely determined by the hygroscopic properties of the cargo inside. The quantity of water vapour contained in the air is small and does not generally result in sweat damage. However, it may lead to other damage, e.g corrosion of metal goods. Relatively large quantities of sweat in closed containers are always attributable to the cargo or its packaging (and/or the container floor if wooden). Sweat is thus actually possible only if water enters the container with the cargo. High air temperatures in the container and the associated low relative humidity drive water vapour out of the hygroscopic cargo. This water vapour condenses on the container walls and ceiling which is cooled by nocturnal radiation. Investigations reveal among other things that, starting with a dry container ceiling and side walls, sweat coverage increases in stages and reaches a maximum after a few days.